So what comprises of three words and eight letters you would say with all your heart to someone who had changed your world and you’d like to be with for the rest of your life? Go figure! 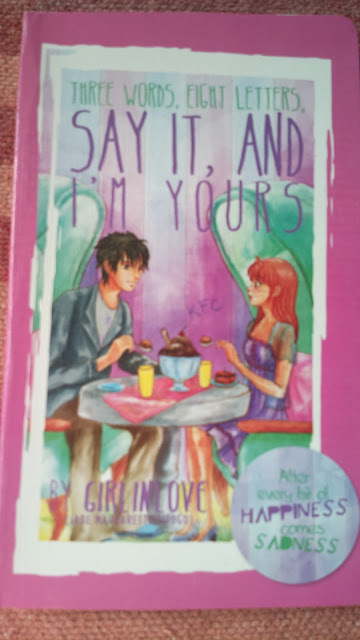 Three Words Eight Letters Say it and I’m Yours is Chanel Courtney Clemente Chua and Kean Patrick Tolentino Padua’s roller coaster love story with exciting twists and turns of fate. Yep, it’s another Pop Fiction by Summit Books book in English and like the rest was a page turner for me. I started reading late afternoon but I stayed up late just to finish the book. I was trying to check how many chapters it was condensed into when I accidentally read the epilogue. So Kean died? That was heartbreaking. I had just finished reading about 1/3 of the book and I realizing that it’s going to be a heart breaker like She’s Dating the Gangster (where both lovers died), I feel appalled yet I continued reading anyway. But something compelled me to Google it and lo! There is a book 2 and it didn’t end with Kean’s supposed death. Whoa! What a relief! In Wattpad, book 1 had already been stripped off contents by the author since the novel is now published and copyrighted by a publishing company but I was lucky enough to have the opportunity to read book 2 which is still available on the site. It’s called Three Words Eight Letters If I Say it Am I Yours? It took me a whole day to read all its chapters (including special and private chapters) but it was worth the sacrifice. I’m even luckier because unlike loyal 3W8L fans who had been diligently waiting for updates since the beginning (2011) and took months to two years to complete, I had the benefit of reading everything in one sitting. :D It’s painstakingly long compared to the published book 1’s English translated, edited, and condensed version but like I said, it was worth the hours spent squinting infront of the computer reading. The twists and turns may be a bit soap opera-ish but I love how it was still Kean till the end despite all other guys who had been part of Chanel or Elle’s life. Although it’s quite unfair since Kean or Yohann or C.H. had Courtney alone while she had other guys to her knees but hey, what a lucky girl! Her name had been tagged together with the other guy’s name including Gianels, Patrelle, Branded Lovers but it’s Coureans (Courtney and Kean) for me forever! Like other Summit Books published local novels, there’s a playlist after the epilogue. Check out other books from the same publishing house too. Several titles are listed at the last pages after the credits. Make sure to search for the actual videos (through YouTube) of the original compositions used on the book too. They were composed by the author Jade Pitogo. This local novel had touched the hearts of millions and had been the subject of imitation. I’ve seen novels within Wattpad boring the exact same title! I wished they had been a little more original in copying (if that’s even possible) by at least changing up the title a little bit, by even a teeny tiny bit. Anyway, have you figured out what three words, eight letters meant? It means I love you!! !